Usually I am quite dreamy when it comes to reading or paying attention to things for long periods of time. This is because my mind starts flowing and thinks of other stuff when I am doing these things (triggered by the content so I am actually paying attention). So I love doing it for the reason that it is very useful as a source of inspiration. Anyway, when I was reading Change by Design by Tim Brown, in the beginning, he explains the “three spaces of innovation” arguing that he does not have a specific step by step process or a recipe to success. In contrast, he argues, “to the champions of scientific management at the beginning of the last century, design thinkers know that there is no “one best way” to move through the process. There are useful starting points and helpful landmarks along the way, but the continuum of innovation is best thought of as a system of overlapping spaces, rather than a sequence of orderly steps. We can think of them as inspiration, the problem or opportunity that motivates the search for solutions; ideation, the process of generating, developing, and testing ideas; and implementation, the path that leads from the project room to the market. Project may loop back through these spaces more than once as the team refines its ideas and explore new directions” (Brown 2009). 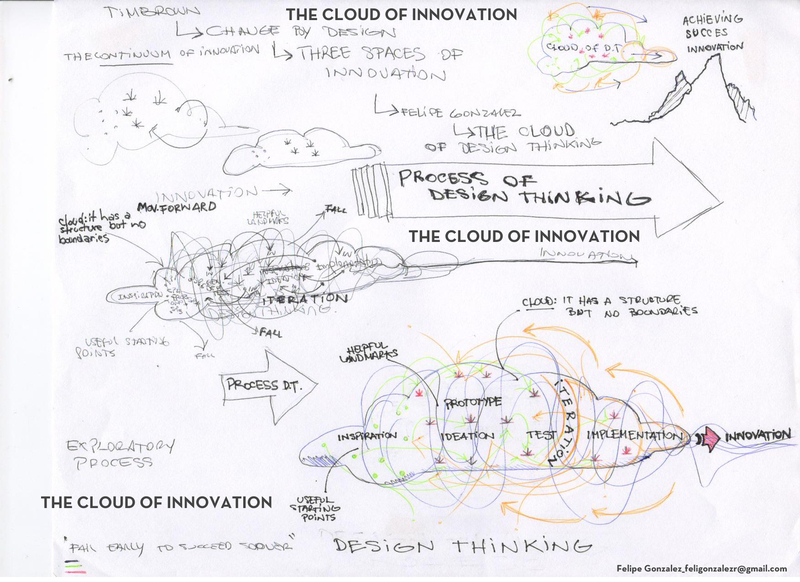 Inspired by this section of his book I started drawing what was going on in my head, putting all these concepts together in what I called Design Thinking, “The cloud of innovation”. This is because I think it has a structure but no boundaries whatsoever and was only to be able to visualize and understand in a better way. 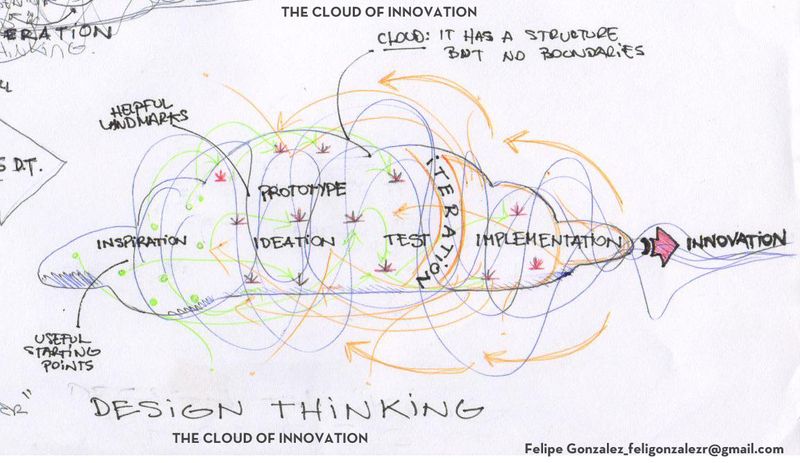 This structure is based on the basic process of design thinking starting with inspiration, ideation, prototyping, testing and therefore iterating, and its final implementation. Inside, it has a number of different projects with its useful starting points that Tim Brown was talking about and helpful landmarks that goes through an exploratory process. Along the way, many of these projects will fall out of the cloud, many will iterate to improve or change directions and many more will go through until reaching innovation. Finally, as this dense cloud generates action inside, it moves forward to success by achieving its goal which is to create value and be truly innovative. 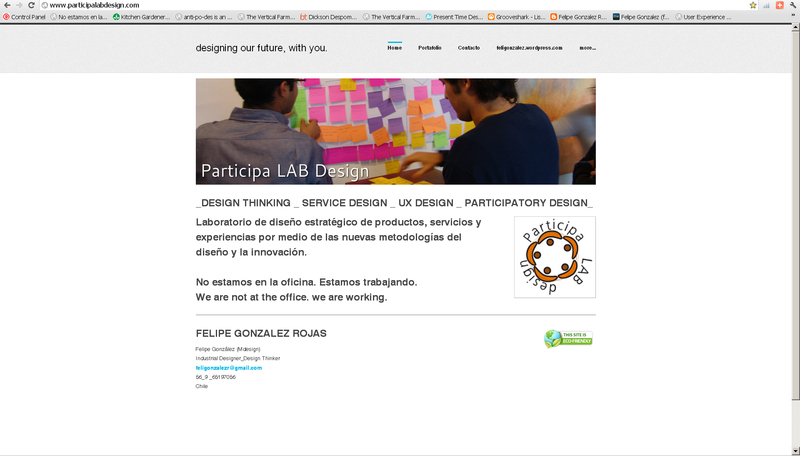 Participa LAB is here to stay! Laboratorio de diseño estratégico de productos, servicios y experiencias por medio de las nuevas metodologías del diseño y la innovación. It has been a while since I haven´t post anything on this blog. It looks like someone (me) has forgotten completely about it but I know that I should be writing more because I have quite some things to share and may be this post will make me start doing something now! Well I was pretty worried when I first got back home to Chile from Australia because I know that design in Chile it is not appreciated like it should. On the other hand, I also had some expectations because I knew that some great things were happening as well. Many things are going on right now in this country in terms of innovation, start-ups, web development, design thinking and more. There are new movements arising with a collective notion of taking all this to another level. And I love it! And I am very happy that I came back to my beautiful country. I have too many projects in my head right now and I am already on one which makes me really happy and proud because I am putting up to work everything that I have learned in the last seven years. Masisa S.A. is a forest product company that manufactures wood boards such as MDF, OSB and particleboards. It is based in Chile and four others countries in South America like Brazil, Argentina, Mexico and Venezuela. In this regard, they are looking into ways of getting out of the box in order to be truly innovative in every sense so they have located innovation labs in everyone of these countries. In order to accomplish this, they believed that the best way to do be innovative in a very safe way was to inject design thinking into the process and this is where I come in to game. Methodology, which includes on one level, training sessions with Seminars on current topics related to design and innovation and on the other level, workshops where all the teams meet and work together. Portfolio management. These are meetings and online sessions with teams individually to share their portfolio in order to gain feedback from their tutors. Regional synergy, which involves regional engagement and collaboration with the intention of achieving bigger porpoises ergo making choices for generating value. 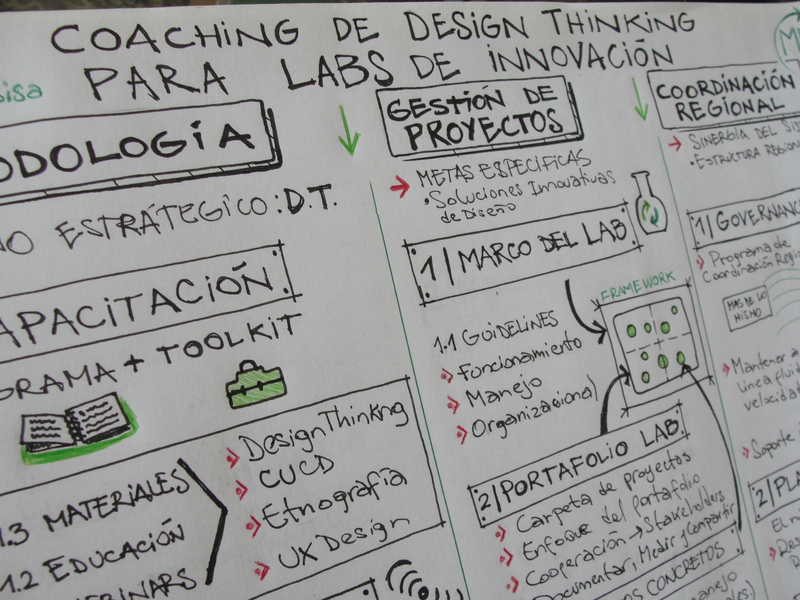 At this point we have had two on-line webinars on Design Thinking and Client-and-user Centered Design that are already making us all feel the excitement for what´s coming in relation to the next regional meeting in Santiago and all the new projects and ideas that will come out of that. However, all this movement is not coming from me or Masisa only and that is the beauty when it comes to sharing and collaborating with design thinking and all the new design methodologies available for us. In this matter, we have been obviously learning from other movements and people we look up to like Design Thinkers. Also from companies like IDEO and their methods, from the HBR and their inspiring articles, from Stanford d.school which has many, many great resources on design thinking such the Crash Course which we are about to have next week (we will share afterwards). In addition to this, we also have been reviewing must-read books such as Tim Brown´s Change By Design Don Norman´s The Psychology of Everyday Things, Roger Martin´s The Design of Business, Kees Dorst´s Understanding Design, Cradle To Cradle and many, many more that I am forgetting about right now. Summarizing, we have been having a lot of fun and very actively involved in this design thinking world however, none of this would have happened if it weren´t for QUBE. 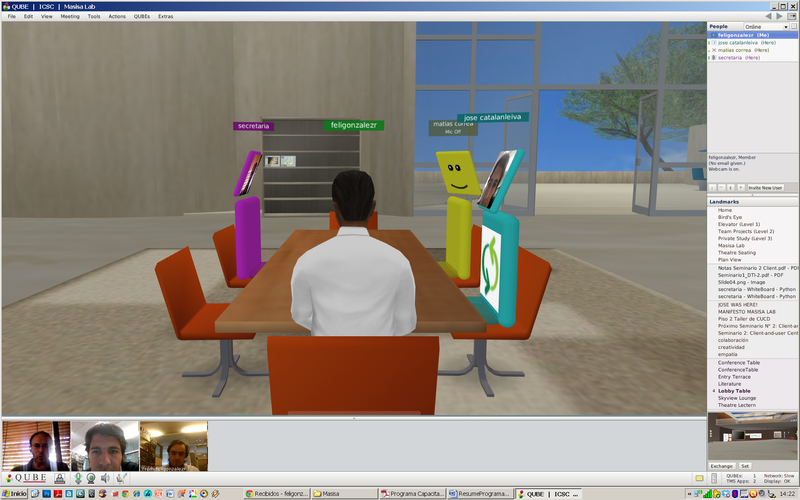 I so need to thank John Fitzgerald and The International Center for Studies and Creativity (ICSC) at the State University of New York letting us use this amazing platform that enables us get in to our avatars and play/work in our lab, where we do everything there, from on-line on-site Seminars, a workshop to share and prototype, all the way to individual rooms specially design for every team. In this regard, we can happily say that no matter where in the planet we are, we can always meet on QUBE. In conclusion I am quite exited for what is happening and what is coming next as well, since everything is set for it and nothing can stop this now for it has been growing for a while. It also feels awesome to be part of this, just like all of you out there doing different things for the same propose which is to design the world for better and make a true change.